We interviewed Canadian mountain biker Sandra Walter (LIV/Giant Canada) at the Mountain Bike Worlds, where she revealed that she had been invited to compete at the Tour of the Dragon in Bhutan, a 269 kilometre one day race in the Himalayas. Walter was the only woman to complete the 2013 event (and only the second woman ever), finishing eighth overall. Below is a release and photos from her sponsor, Giant Canada. Liv/Giant Canada's Sandra Walter of Coquitlam, B.C., made history as only the second woman ever to complete the grueling 268-kilometre Tour of the Dragon, arguably the world's toughest single day mountain bike race, which was held for the fourth time in the Himalayan Kingdom of Bhutan on September 7. "Epic doesn't even begin to describe the Tour of the Dragon," said Walter, who completed the race in 13 hours. "I've never done anything like it, because there isn't anything else like it." The overall race winner, a Bhutanese rider who goes simply by the name Sonam, successfully defended his 2012 title of 'Son of the Dragon,' but was unable to break the 11-hour record he set last year, finishing the 2013 edition in 11 hours, 13 minutes. The first woman ever to complete the event, Yeshey Dema of Bhutan, accomplished the feat in 2011, placing 19th overall. "I had a great support crew out there and lots of people cheering me on. My guide and driver were awesome and they really helped me get through a very long day in the saddle," said Walter. A veteran mountain bike racer, Walter has competed in events all over the world. The part-time staffer at Local Ride Bike Shop in Maple Ridge, B.C., won the trip to Bhutan and an entry into the Tour of the Dragon through a contest facilitated by North Vancouver's Q Energy Drink. By winning two of three qualifying races, the Test of Metal in Squamish, B.C. and the Canada Cup in Sudbury, Ontario, she was entered twice into the draw that saw her name pulled as the lucky recipient of the unique Himalayan adventure, presented by the Bhutan Olympic Committee and Amankora Resorts. She competed in all three races aboard her trusty Giant XTC steed. "It was amazing," said Walter of the Tour of the Dragon. "It was definitely one of the most challenging days I've ever experienced on a bicycle, but it was also one of the most memorable." And that's saying a lot. Walter has been competing for over 15 years and has represented Canada at six World Championships, including the most recent edition held in South Africa only a week before the Tour of the Dragon. "It [Tour of the Dragon] was pretty difficult to prepare for," said Walter. "I only had a short time to make the trip from South Africa to Bhutan, and then recover from four straight days of travel, and acclimatize to the altitude." The race's lowest was 1,200 metres above sea level and the route traversed four high mountain passes, topping out at 3,340 metres. The 40 racers started at 2:00 a.m. on September 7th in the town of Bumthang in pitch darkness pierced only by their own bike and helmet-mounted lights and the headlights of vehicles. They encountered heavy rain and thick fog on the twisting narrow roads as they made their way from Bumthang to Thimphu. "At one point, the fog was so thick I had to slow to what felt like a crawl, and I was still scared I would run straight into a cow or something," said Walter. Once the sun rose, riders could finally see their breathtaking surroundings, including blue pines, thousands of Buddhist prayer wheels, traditional farmhouses, verdant mountains, strings of vibrant prayer flags, sacred temples, monasteries, fortresses, rice paddies, and misty cloud forests. Unfortunately, the high rocky peaks of the Himalayas eluded their view, due to the persistent clouds that mark Bhutan's monsoon season. "I was a little bit sad that I never saw the snowy peaks I was told surrounded us," said Walter. "But the beauty of the country blew me away - not only the scenery, which is gorgeous - but also the cultural and spiritual aspects. Buddhism and tradition are steeped in everyday life." The toughest part of the race for Walter was the 50-kilometre climb up the fourth and final pass. "I felt so strong at the bottom of Dochula Pass. It felt like there was so much oxygen down there at 1,200 metres, but once I had climbed to about 1,800 metres, my speed just dropped. It's pretty overwhelming, realizing that it's going to take you about three or four hours of non-stop climbing to get to the top." 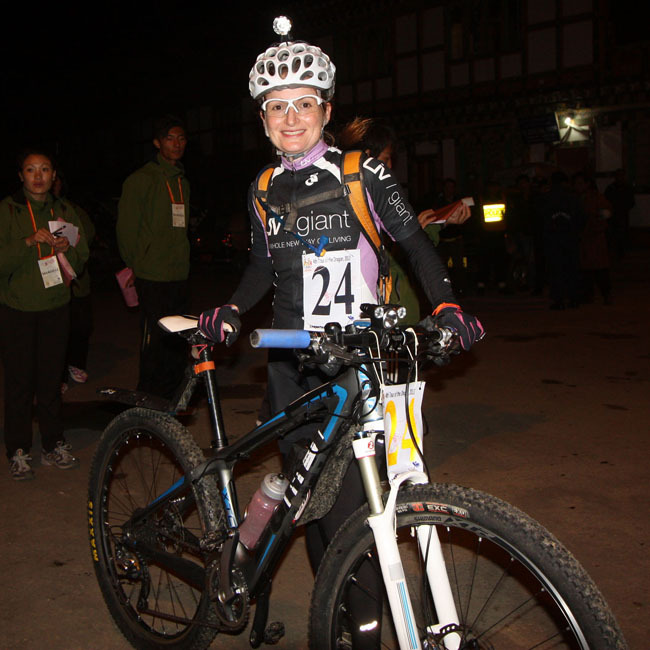 Walter did reach the top, despite her doubts, and she was rewarded with a long, fast downhill to the finish line in Bhutan's capital city, Thimphu, which she was the eighth rider to cross. "The descents were super fun," said Walter, who used her world-class mountain biking skills to their utmost to dodge rocks, potholes, dogs, cows, pedestrians, and vehicles. "I really enjoyed challenging myself on the tight corners, but I was constantly aware that I needed to be ready for anything around the bend - an oncoming truck, a herd of cattle, a sleeping dog, or a cliff." In addition to police and military personnel, the route saw a whopping 1,000 volunteers mobilized to assist the racers, many of whom were schoolchildren manning feed zones, cheering enthusiastically, and offering drinks and food. "I got goose bumps whenever I rode through sections lined with cheering young people," said Walter. "They definitely motivated me to keep pedaling and when they saw that I was a woman, they would cheer extra-hard. I quickly realized that I was a role model and I tried to thank all of them by smiling and waving as I rode past." The Tour of the Dragon is an experience that Walter will never forget. "I really treated it as a once-in-a-lifetime thing," said Walter. "Even though I was racing, I tried to soak up everything. I was really lucky to have a great support crew and lots of people who helped me prepare for this crazy adventure. Now that I look back on it, I can hardly believe it happened." The magical Kingdom of Bhutan clearly made its mark on Walter as much her tires left their tracks on its soil. For more information, visit www.tourofthedragon.com .